TwoPlus is a development of MuirMcNeil’s TwoPoint modular type system. The TwoPlus project began as a custom type collection for use in the 2015 Summer and Postgraduate Shows identities for the London College of Communication. It was completed in an extensively revised and expanded form for the identity of TypeCon 2016 on behalf of the Society of Typographic Aficionados. In TwoPlus, seven monospaced type collections comprise forty-eight typefaces in matched ranges of calibrated weights. Each TwoPlus font also features a set of rectangular background panels in corresponding grid patterns. 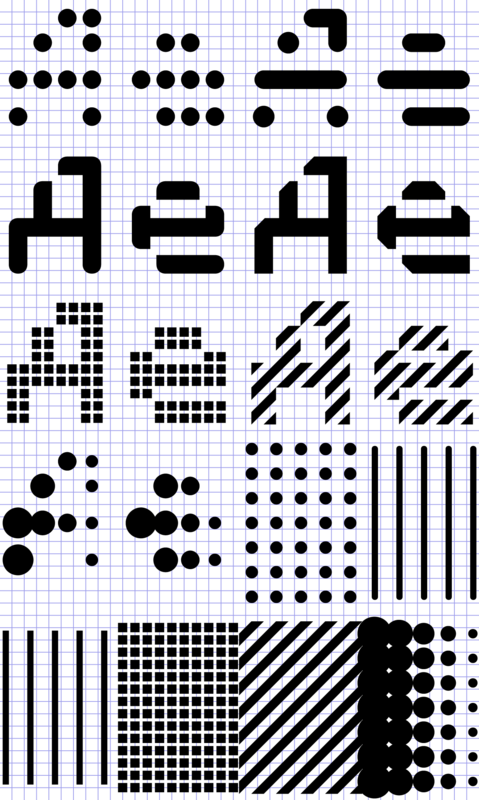 In TwoPlus, like other MuirMcNeil typefaces, individual letters operate as variable components within differential visual systems. A common grid, shared with the TwoPoint typefaces, determines positioning for both letter contours, panels and spaces in all TwoPlus typefaces, with every element and space aligning precisely. TwoPlus typefaces are designed to interact with one another, and with those of TwoPoint, offering a huge range of visual possibilities. Using page layout, bitmap or vector design software, the user can apply selected styles to letterforms and background panels either in precisely interlocking layers or in easily calibrated offsets. Outlines, tints, colours, textures, patterns and transparencies can be applied as appropriate. When overlaid in pairs, the 76 fonts across TwoPoint and TwoPlus allow for a possible 5,776 combinations. These features provide an enormous number of possibilities when working in print and fixed media. They are also particularly useful in motion graphics where their precise layering and positional calibration can provide perfect control over transitions and many other exciting visual opportunities.